Size of this JPG preview of this OGG file: 800 × 400 pixels. Other resolutions: 320 × 160 pixels | 640 × 320 pixels | 1,000 × 500 pixels. English: Pianists S17 and S24. 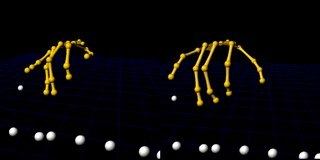 The video shows hand reconstructions of the smoothed marker data of Pianists S17 on the left and S24 on the right. The white spheres in the foreground (and one next to the pianists’ little finger) are markers attached to the piano keys. The original recordings were slowed down by a factor of 5.4 and 5.8, respectively (as S17 performed at a slightly slower rate than S24), to match each other visually. The video file does not contain sound. Source Video S1 from Goebl W, Palmer C (2013). "Temporal Control and Hand Movement Efficiency in Skilled Music Performance". PLOS ONE. DOI:10.1371/journal.pone.0050901. PMID 23300946. PMC: 3536780. 20 s, 1,000 × 500 (3.52 MB) Open Access Media Importer Bot Automatically uploaded media file from Open Access source. Please report problems or suggestions here. Pianists S17 and S24. The video shows hand reconstructions of the smoothed marker data of Pianists S17 on the left and S24 on the right. The white spheres in the foreground (and one next to the pianists? little finger) are markers attached to the piano keys. The original recordings were slowed down by a factor of 5.4 and 5.8, respectively (as S17 performed at a slightly slower rate than S24), to match each other visually. The video file does not contain sound.